Turbo STS replacement control valve. Free Shipping. Flame Thrower Valve Replacement. Flame Thrower control valves are interesting because they integrate the piezo module and the electrode in a design that literally throws gas out in a cloud and then ignites the gas so the fire-ball will ignite the burner. This type of control valve has a tremendously high success rate for ignition without having to maintain much. The problem comes as the grills get older and have not been kept clean so flare-ups and excessive heat can cover the tip of the electrode with carbon or melt the wiring. Fortunately the valves are easy to replace. 1. For additional information images and video of flame thrower style control valves visit our installation video blog post: Flame Thrower Video. 2. Video Blog Post shoes valve installation and ignition installation: Installation Valve and Ignitor Video. 3. Replace Control Valve 37088 in Classic and Elite Turbo Models: Click For Control Valve Install Instruction. Replacement gas valve for turbo STS gas grills with 720-0057 model. Ever Since These Control Valves Became Unavailable we have been scrambling to find a control that will replace the originals. With No Luck we sent one of our last flame thrower valves to a control company who fabricated this valve for us. 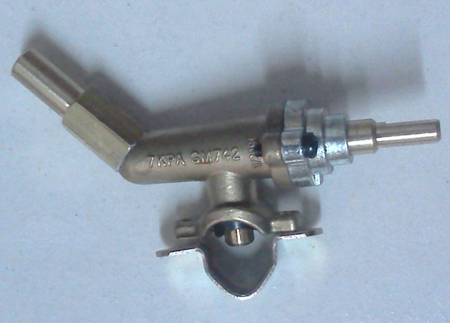 Although not a flame thrower, this control valve was designed to have the same clamp-on connection size, same valve stem and same orifice extension angle. 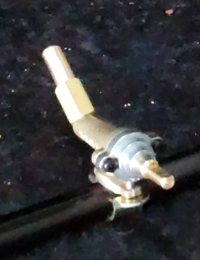 The STS valve for the 720-0057 Turbo models has this flame thrower valve with the extended orifice. 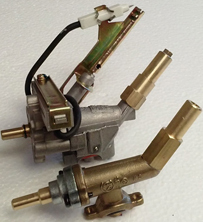 The same control valve was also fabricated into models by Jenn Air, Kirkland and some others who use this same valve. The extended orifice is the detail to look for to determine if this is your control valve replacement. The New Valves we had fabricated as replacements also clamp onto the gas manifold pipe. 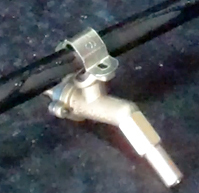 The valve stem is the same size and direction and the extension has the same orifice and angle to attach to the burner venturi in the control area of the Turbo STS barbecue. As we can see here in these images the valves fit exactly the same. The only serious difference is the ignition. These valves were very expensive to only manufacture a few thousand and adding the flame thrower finctionality would have doubled the price. Instead we change the battery-powered ignition module that ignites the rotisserie. 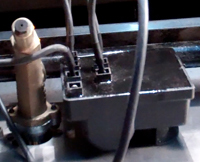 The current ignition module has one outlet so we replace it with a 4 or 6 outlet module. Replacing the module and electrodes is simple and not very expensive. Also, if one or more burners still have a flame thrower valve these burners will ignite the burners next to them. 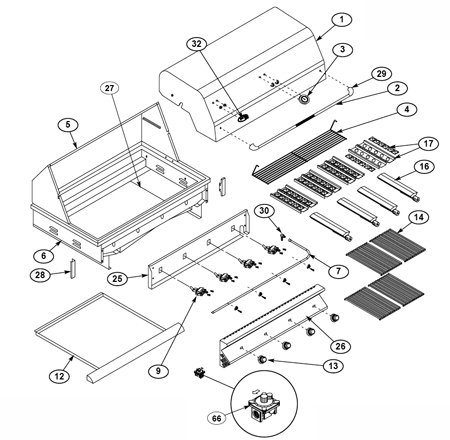 This is the exploded view schematic for the STS gas grill. Please note there were three different barbecue grills purchased by the same retailer and all were called STS models. Two STS models had flame thrower valves but the orifice on the flame thrower valves were different. This orifice is 6 mm across which is very small. 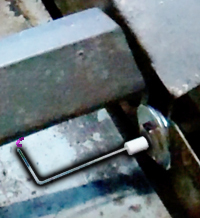 Many clients mistakenly see the entire extension as the orifice and try to remove it to convert the grill from gas to propane or liquid propane to natural gas but only the small tip at the end is the gas orifice. Replacement gas valve for turbo STS gas grills with 720-0057 model. 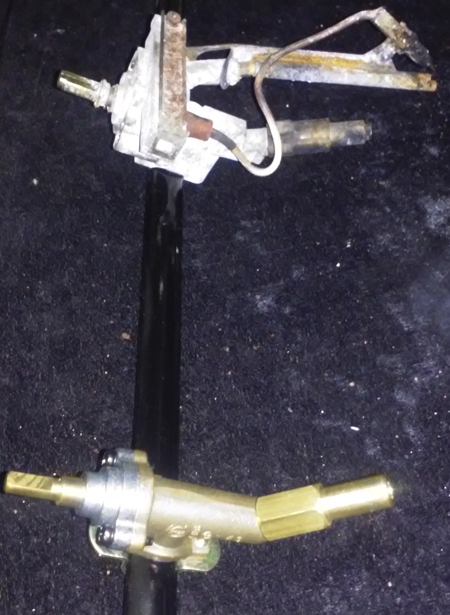 Flame thrower valvbe comes with NG orifice and ignition and is ready to clamp onto STS manifold. 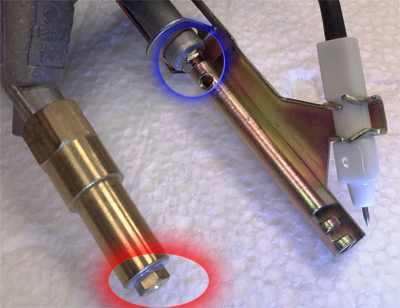 Valve Maintenance -- leaking: O-ring type gasket for clamp-on barbeque grill control valves. 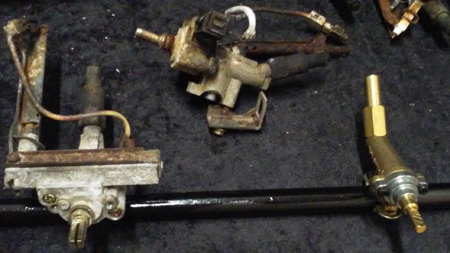 Control valves that go bad usually get damaged from heat and begin to leak where it attaches to the manifold. This is the gasket that fixes the seal from a clamp on valve attached to the barbecue grill manifold. 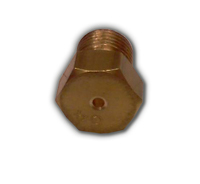 Replacement gas orifice has quarter-inch hex-head diameter. This orifice threads to this 3153 valve And is the orifice in the original Flame-Thrower Turbo STS valve. Orifices are new from the manufacturer. We drill orifices for factory BTU settings when full configuration of orifices is selected with the appropriate hose and regulator to be installed together. The drilled orifice opening for a specific BTU limitation is calculated by fuel pressure. 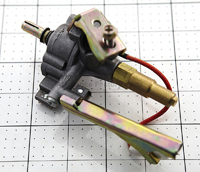 Although not an electrode designed for Turbo and Jenn Air and other models, we use this ignition electrode as a retro-fit installed in flame thrower models so we can make them spark against the burner in any place necessary for reliable ignition. Electrodes ship with additional washers for proper installation, $15. Sometimes barbecue companies who buy product overseas and then put their name on these products so it seems to be their own brand have a difficult time getting replacement parts. This control valve is designed to have the same attachment to the manifold, stem for the knobs and orifice extension as the original valve. These controls will control the burners and gas flow although ignition must be different. Installing these replacements often means we will also need to replace the battery controlled ignition module in the Turbo STS model barbecue grill. How Does A Flame Thrower Work? Valve Instllation Video Tutorial post. Installation Valve and ignition Video. Flame Thrower valves have 2 orifices whereas most barbecue grill control valves only have a single orifice which limits the amount of gas that can flow into the grill burner at any time.